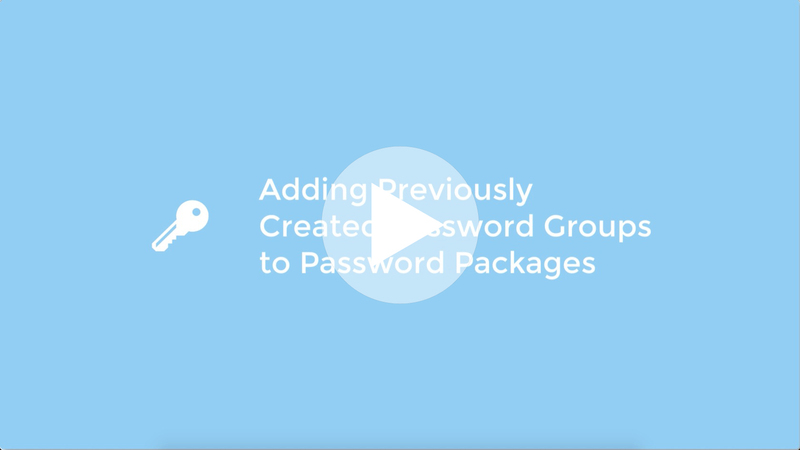 You can add previously created Password Groups to new and existing Password Packages. For example if you have created Password Group 1 in Password Package 1. Then re-use Password Group 1 in Password Package 2. All players that have Package 1 or 2 applied will be accessible with passwords generated in Group 1 as both password packages have Group 1 associated to them. If you make any changes to Password Group 1, all changes will be applied to any Password Package that uses Password Group 1. If you want to check out some Password Restriction Demos and extra information please visit our Password Protection information page. To add an existing Password Groups create a new Password Package. Now with the new Password Package created select the Existing Passwords Group section from right hand configuration panel. With the Existing Passwords Group section expanded you will see any previously created Groups. Simply click on your desired group to add it to the current Password Package. To save your Password Group and Password Package simply click on the green ✅ Save button below.